In January of 1943, the army had begun to experiment with clearing man-made beach obstacles at Fort Pierce. On 6 June, Adm. Ernest J. King, the chief of naval operations, gave the order for the training of Naval Demolition Units. By coincidence, his order was issued exactly a year before the Allied forces landed at Normandy against the most formidable array of beach defenses ever erected. This was also five months before Tarawa, and Washington’s concern seemed to be focused more on the problem of dealing with the obstacles Hitler might place along the French coast than with the island-hopping campaign in the Pacific. Picked to lead this new effort was a young naval reserve officer named Draper L. Kauffman, one of the most colorful figures in the history of naval special warfare. A very slender man who stood just about six feet tall, Kauffman had graduated from the U.S. Naval Academy in 1933. In those depression years, the navy seized on any excuse to deny commissions to those completing the course at Annapolis. Of the 432 graduates in Kauffman’s class, only 216 received commissions. Even though Kauffman’s father was a senior officer, he was screened out because of his poor eyesight. But by the time of Pearl Harbor, Kauffman had managed to see more of war through his thick Coke-bottle glasses than his classmates who had been granted commissions. Using his naval background, he went to work for a steamship line and was assigned to work in Europe early in 1939. He spent two months in the company’s offices in England, two in France and two in Germany. He twice attended speeches by Adolf Hitler and, even though he couldn’t understand German, found him thoroughly frightening. In mid-1939, he returned home convinced not only that war was imminent, but that the West would lose. Shortly after war broke out in September, he signed up as a member of an American volunteer ambulance corps. When the Germans attacked France on 10 May 1940, he was attached as an ambulance driver to an elite French unit operating in the no-man’s-land between the Maginot and Siegfried lines. The next two weeks were filled with horror. Kauffman learned three lessons from that experience: he gained a great and lasting respect for the infantry; he understood how a man can throw down his rifle and run away; and he vowed that if he ever got into combat again, he would again want to be in a volunteer outfit. As the German juggernaut rolled westward, the French hospital closest to the front lines was overrun, leaving the French wounded without adequate care. A French general asked Kauffman if he would drive his ambulance back through both French and German lines and try to get the most seriously wounded to the hospital. Kauffman and a German-speaking lieutenant set off, ringing the bell on the ambulance frantically. The scene was like a pastoral painting, with cows grazing peacefully in the fields. Suddenly they saw a movement at the side of the road up ahead. Kauffman and his aide jumped out with hands over their heads, shouting “Kamerad!” When he thought about it later, the scene seemed like something out of a grade-B movie. But at the time, it was deadly serious. The German soldiers permitted them to continue on to the hospital, from which they had helped evacuate the wounded only three days before. But then they were made prisoners. Because he was an American, Kauffman was eventually released and worked his way, over a period of a month and a half, down to Lisbon, across the South Atlantic to Brazil, up to Boston—and back to Scotland as a volunteer in the British navy. This was nearly a year and a half before the United States entered the war. In a sense, Kauffman seemed to go out of his way to look for trouble. But trouble also came looking for him. While he was in a British naval school, a German bomb fell nearby and British army experts moved in to disarm it. As they worked, the bomb went off, killing the army crew. The next morning, a call went out for volunteers for bomb disposal. It was only after Kauffman had volunteered that he went out and took a sobering look at the hole in the ground where the army experts had been atomized. Kauffman worked throughout the German blitz against Britain in the winter of 1940–41 and into the spring of 1941. Much of the work was unglamorous manual labor—digging as deep as thirty feet in the ground and shoring up the earth around the bomb before beginning the delicate business of disarming it. The British quickly learned that the German bomb fuzes were numbered and that the numbers told what kind of fuze it was. A number ending in 1 was an antidisturbance fuze. A 7 meant a time fuze. A 4 was antiwithdrawal, and 5 was a straightforward arming fuze. The numbers remained a reliable guide because the Germans needed them to disarm bombs when their planes crashed at home. But two other devices seriously complicated the task of the disarmament experts. One was a two-thousand-pound mine dropped by parachute. If the mine came down on land instead of water, it was supposed to go off seventeen seconds later. But sometimes the fuzes jammed and the experts were called in. If in tinkering with the mine, the bomb-disposal man started it ticking again, he had something less than seventeen seconds to get away. The first mine Kauffman saw and successfully disarmed came down in Liverpool about Christmas time. He found it in a house of ill repute, sitting in an overstuffed chair draped in Christmas streamers. The other threat was the German acoustic fuze. It was designed to react to any noise and begin ticking. The rule the bomb disposal crews worked out was to wait ten to twelve seconds after making any sound lasting more than half a second. Thus, if a man was trying to remove a screw, he would turn it a quarter turn, check his watch, turn it another quarter turn, and so on. On 2 January 1941, Kauffman was working on an acoustic fuze when his hand slipped and he heard the fuze begin to tick. He ran and was far enough away to survive, although the blast of the bomb hurled him through the air. His British commander awarded him a certificate for setting a new record in the one-hundred-meter dash. After the blitz ended in May 1941, Kauffman returned to the United States and finally received his navy commission. His eyesight had not improved, but his experience was too valuable to waste. He was assigned to set up an American bomb-disposal school. But before he could get the school organized, the Japanese struck Pearl Harbor. A week later, he was in Hawaii disposing of unexploded bombs. One bomb had landed just outside an ammunition depot at Schofield Barracks. Kauffman, with no experience with Japanese ordnance, approached it with extreme care, fearful of an ingenious device that might quickly take his life. In spite of Kauffman’s modest appraisal of the danger, he was awarded the Navy Cross for his work at Pearl Harbor. Kauffman finally organized his bomb-disposal school at the Washington Navy Yard in January 1942. Except for Kauffman, who had been assigned to set up the school, the class was made up entirely of volunteers, all of them bachelors. For the next year and a half, Kauffman turned out bomb-disposal experts, first at the navy yard and then at American University, in northwest Washington. Much of the training involved digging deep holes. The final exam required nearly thirty hours of hard work, a foolproof way to find out if a man would become careless with fatigue. This reliance on physical stress as a way of testing a man’s capability and screening out those who don’t measure up remains an important part of the training of the navy’s SEALs to this day. Today’s SEALs are also experts on using explosives and, if need be, disarming enemy munitions. So there is a direct link back to the bomb-disposal experts Kauffman trained half a century ago. In May of 1943, Kauffman was called back from his honeymoon to set up a school to train the first Naval Combat Demolition Units, generally considered the direct ancestors of the SEALs. In a hurried meeting in Washington, he was shown pictures of obstacles being built on the beaches of France and told to “put a stop to that.” With his orders came a document permitting him to travel wherever he had to and to assemble the men and equipment he needed. On 6 June 1943, the same day that Admiral King issued his authorizing order, Kauffman set up shop at Fort Pierce, a short distance from the old casino occupied by the Scouts and Raiders. The first volunteers came mostly from the Seabees, the legendary navy construction battalions, with officers raided from the bomb-disposal school. Training began with a one-week ordeal that is still known as Hell Week and that quickly eliminated 40 percent of the class. The survivors were proud of their accomplishment, but they joked that “Hell Week separated the men from the boys; the men had sense enough to quit and left us with the boys.” That humorous assessment reflected a more serious concern, one that has continued to nag at those responsible for selecting members of the Underwater Demolition Teams and the SEALs. Since no one knows just what it takes for a man to excel as a SEAL, how can one be sure that men who might make superior SEALs are not being screened out by the contrived hardships of Hell Week? The trainees at Fort Pierce spent much of their time in rubber boats and in the mud, and they ran miles every day. But surprisingly, little attention was paid to swimming. The assumption was that they would paddle ashore as part of an amphibious operation and do their demolition work in relatively shallow water while army demolition experts took over at the high-water mark. Although men of the Underwater Demolition Teams later prided themselves on their nickname of the Naked Warriors, the trainees at Fort Pierce were anything but naked. They did their work dressed in soggy fatigues, with heavy boondocker shoes on their feet and awkward metal helmets on their heads. Much of their training was done at night. The men quickly became adept at handling high explosives. Those who couldn’t overcome their fear of being blown to kingdom come were sent off to other assignments. They were probably the smart ones. As the UDT men later realized, they and their explosives-filled rubber boats were disasters waiting to happen. Although Kauffman was probably the nation’s expert at disarming bombs and mines, the demolition men had a good deal to learn about handling explosives safely, placing them on obstacles at the edge of the sea, wiring the whole complex together, and making it all blow up at the same moment. One breakthrough was the brainchild of a man named George Kistiakowsky, an irrepressible scientist who loved to careen around the compound at the controls of a tank and who quickly earned the nickname of the Mad Russian. It was his idea to stuff blocks of tetryl, a powerful explosive that comes in the form of a yellow powder, into floatable rubber tubes. Packing eight two-and-a-half-pound packages of tetryl into a section of tube created a twenty-pound length of explosive hose that could be towed by a swimmer, manipulated in the water, and wrapped around an obstacle. Later, much longer explosive-filled tubes, based on Kistiakowsky’s original concept, were used for clearing obstacles and blasting trenches on the ocean floor. Kistiakowsky was a favorite in the training compound until he disappeared one night. Shortly after the war ended, Kauffman saw a picture of Kistiakowsky with Robert Oppenheimer and learned he had been spirited away to work on the first atom bomb. Kistiakowsky later went on to serve as science adviser to President Eisenhower. Kauffman and his men worked hard not only at training but at developing workable tactics. Still Kauffman couldn’t rid himself of a nagging worry. He couldn’t picture his men paddling ashore in their explosives-laden rubber boats, groping around in the dark, and successfully destroying the enemy’s beach defenses. He had the uneasy feeling that they were really trying to prepare for an impossible mission. 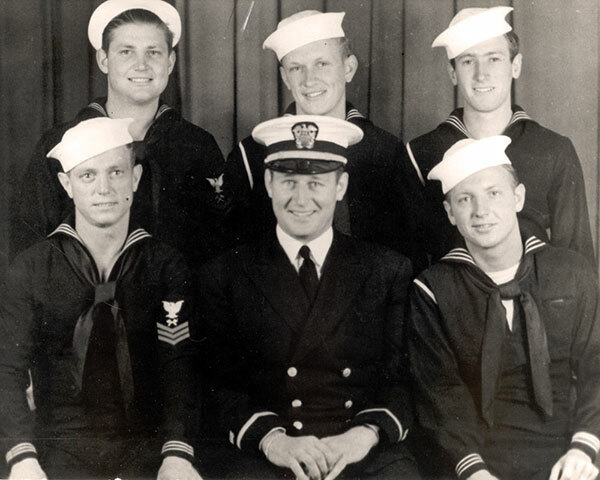 Despite his misgivings, the first six men of the Eleventh Naval Combat Demolition Unit were sent to England early in November 1943 to begin preparing for the Normandy invasion.